My occasional blog about things generally not to do with cycling. Why I'm not attending Velo-city in Adelaide in 2014. Sorry, I'm not that sort of "environmentalist"
In the last few years I've received several invitations to attend events a long distance from where we live. In the past these included invitations to visit the USA and Brazil. In May I received an invitation to be a keynote speaker at next year's Velo-city conference. I am told that "the conference is expected to attract more than 800 delegates from Australasia, Europe, Asia Pacific and North America" and I'm absolutely certain that it will be interesting for the delegates. However it's impossible for me to square the enormous use of fossil fuels which would be required to transport me half way around the world and back again just to make a presentation lasting a few minutes. Thank you for your invitation to attend the Velo-city conference as a keynote speaker in May 2014. I'm very sorry that I've taken so long to get back to you about this, I'm really flattered by the invitation but the reply is difficult to write. I try to live my life according to my beliefs and with as little hypocrisy as possible. My cycling advocacy comes from a deeply held belief that cycling is at least a partial solution to many of the problems that human beings currently face. In one stroke, cycling helps to reverse obesity, give children/older people/those with disabilities more freedom, improve air quality in our towns, save lives due to enhancing health and reducing the shocking amount of violent death which occurs on our streets. Cycling also reduces dependency on foreign oil and therefore reduces the number of lives lost in conflict for that oil and, perhaps most important of all, it also reduces the carbon footprint of everyone who chooses to cycle instead of use a vehicle powered by fossil fuels (directly or indirectly) for their journeys. This is where the problem arises. In order to attend Velo-city in Adelaide I would have to fly a round-trip distance of 32000 km. Making this trip would equate to several times my usual annual impact on the planet simply to make a presentation lasting a few minutes. I cannot possibly square this with my conscience and I must live within my own moral guidelines. I suggest that others don't fly long distances and while it would no doubt be very convenient to excuse my own excess by saying that it's for a higher purpose, I have to apply the same morality to myself as I would to others. I wish you all the success in the world with improving the cycling modal share of your city and I hope you can learn from the best examples in the world. These are to be found in the Netherlands. There's no other country that comes close. If it would be helpful, I could perhaps record a video exclusively for you to show at the Velo-city conference in lieu of my own attendance in person. I have already had the discussion with one email correspondent about how my presentation could cause "100 people to do 1% less driving each" and that this "equals your journey's damage", but I don't buy that. Besides, there's not just one person going, but "more than 800 delegates". I won't be one of them. It simply does no good for each of us to live beyond our, and our planet's, means. Gandhi once supposedly said that we "must be the change we want to see". Whether it was actually him who said it or not is irrelevant. It still makes sense. If we all live as hypocrites how can we expect to make the world into a better place to leave for our children ? I urge all readers not to excuse themselves. If you believe that global warming is an issue, don't take unnecessarily long journeys either for leisure or for work. Yes, being offered international travel for free might seem like a lovely perk, but it's not something we should be doing, whoever pays the air-fare. If you believe that such a journey is necessary, consider why you believe that to be the case. The only practical way of reducing your personal energy consumption and your personal footprint on the planet due to travel is to travel less. Switching between modes (i.e. train rather than airliner) helps far less than reducing distances. We all need to consume fewer resources and we all need to stop treating our own usage as something exceptional and excusable. 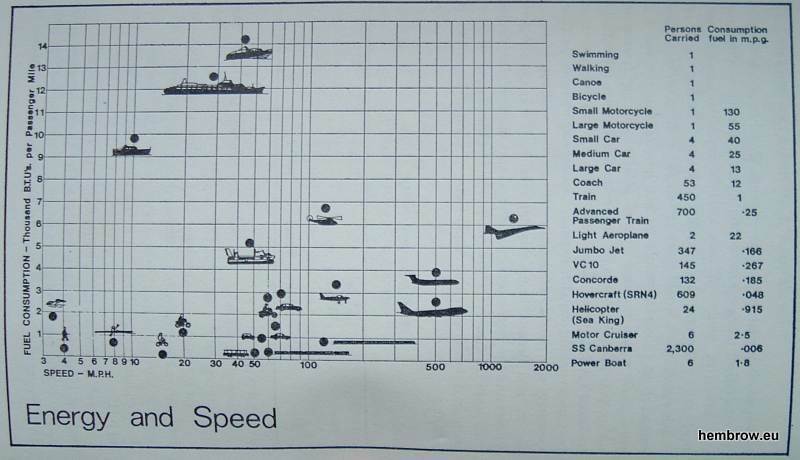 Rough comparison of energy consumption of modes of travel from "Instead of Cars" by Terence Bendixon. It's an old reference (1977) but not much has changed. 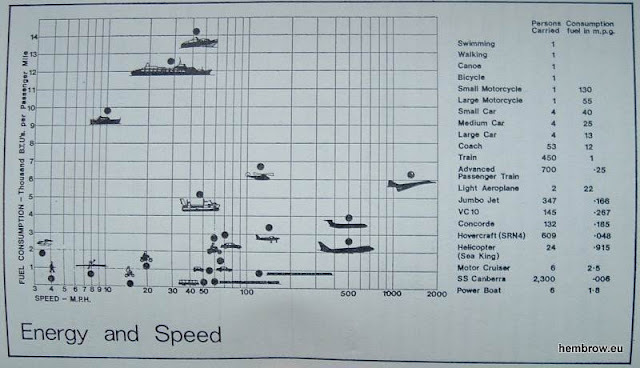 Airliners are now somewhat more efficient than shown here, cars are a little more efficient, other modes much the same as before. The difference between travelling by train vs. aircraft comes down to a factor of about 3. Whatever you do, don't imagine that you do the world any good at all if you travel on a passenger ship instead of by air. Nearly a year has passed since I was invited to Velocity. The event is now underway and lots of people from around the world are in attendance. I did not go for the exact reasons explained above. The organisers did not take me up on the offer of sending them a video. It was just pointed out to me on twitter that one of the sponsors is an oil company. So I looked at their website, and that's not all that that I found. I find the whole thing incredibly sad. Many of the eight hundred delegates, including people with titles like "environmental consultant", have travelled half way across the world, consuming any amount of energy and producing any amount of pollution to do so, merely so that they can talk about the environmentally friendly form of transport called cycling. In many cases they're actually using this to make marketing claims (the usual suspects have been exaggerating). What's more, this is happening at an event which is not only in part sponsored by an oil company but is also has two airlines as "official partners" (so at least three companies are using velocity to give themselves a nice greenwashed image) but which also describes itself as "a sustainable event" seemingly based on taking such minute steps as feeding waste food to a wormery. It's high time that people started to join the dots together and think about what they are doing, what they are part of, and what their responsibilities ought to be. Want to know more ? This year I made a presentation about the environmental effect of travel and wrote a blog post explaining more about the problem. "Green cars" are not going to save us. (c) 2013-2016 David Hembrow. Theme images by gaffera. Powered by Blogger.